Here you are, living life in this millennium. You have a comfortable life: plenty to eat, a bed to sleep on, maybe you've got a cat to take care of, one that gives really nice snuggles. Every once in a while though, don't you feel like doing something different? Are you sick of just living for yourself? You know what you need? A mission. That's right, we're a costume company and we're doling out responsibilities. Well, we're humble, we won't be offended if you don't choose to accept our mission. You'll have a pretty interesting life as Edward Kenway, though, we promise. All you need is some complicated technology, some time, and a really great outfit. Good old Eddie, started out as a privateer for the British Navy but you know what that usually leads to, yep, piracy. Well, maybe your mission isn't exactly the most noble. Just be the best pirate you can be, get in there with Captain Kidd, and see what happens. Honestly, if you're the one reading this then you're probably farther in the game then we are. Sea navigation is so much harder than running around on land. One thing about your mission is certain, you must have an awesome ensemble. Other than honor and legacy, what's the point of becoming an assassin if you aren't wearing the iconic hood and harness? 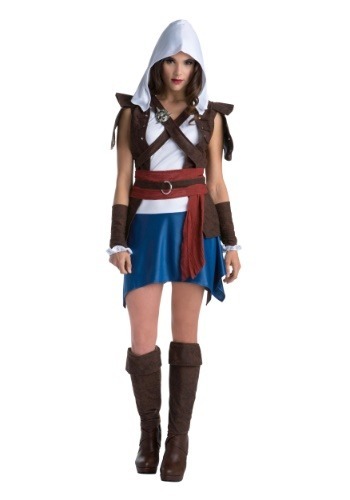 You'll look ready for land and sea when you put on the dress with blue skirt, pirate pin, and red scarf. Keep combat ready with the leather-look gauntlets and some tall boots. In this ensemble, your mission, if you choose to accept it, is a piece of cake--just watch out for those mercenaries.